This summer school is aimed at people of all levels of experience who wish to challenge their creative thinking, or who are at the very beginning of their creative journey, or who would welcome intense support for a specific project. While it is primarily textile and design based, the course will also appeal to artists or designers who work in other media, as a catalyst for developing ideas and extending their creative approaches. 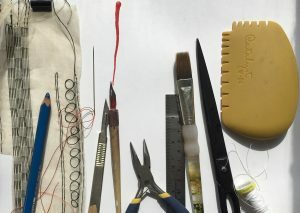 The course will focus on colour, line, texture and mark-making with fabric, paper and stitch. There will be a strong emphasis on experimentation, encouraging and exploiting the unexpected and accidental. Drawing will be a key aspect, though not in any conventional sense of the word. Inspiration for textile and mixed media work will be developed, through research, drawing and the design process alongside textile techniques. This will help you to develop a new body of work and a keen sense of direction for your next steps. You will work individually, but with strong support from Claire and will have a chance to discuss and share ideas with the rest of the group. Claire Heminsley studied textiles at The Glasgow School of Art, specialising in embroidery. 30 years ago she set up INCAHOOTS and expanded her work to include illustration. During this time she has worked on a wide range of commissions, exhibitions and projects. Claire works with a broad range of media and consequently has a diverse output, from detailed scraperboard prints to more experimental sculptural and mixed media pieces for exhibition. Alongside this she has taught design, textiles and illustration in further and higher education and for workshops throughout Scotland. Her design practice feeds into her teaching and vice versa providing a perfect combination.